Federal criminal prosecutions of individuals apprehended by Customs and Border Protection (CBP) along the southwest border with Mexico jumped 30 percent in April 2018 over March figures. Since January, criminal prosecutions were up 60 percent, rising from 5,191 in January to 8,298 in April. This increase followed rising border apprehensions and Attorney General Jeff Sessions' April 6, 2018 announcement of a "zero-tolerance policy" for illegal entry and re-entry. The Attorney General urged all U.S. Attorney's Offices along the Southwest Border to escalate efforts "to prosecute those who choose to illegally cross over our border." Southwest border apprehensions still dwarf the number of criminal prosecutions. In April 2018 preliminary estimates indicate that criminal prosecutions totaled 22 percent of Border Patrol apprehensions that month, up slightly from 20 percent of BP apprehensions in January 2018. See Figure 1. Prosecution counts are based upon government case-by-case records on each prosecution referred by CBP. The data was analyzed by the Transactional Records Access Clearinghouse at Syracuse University, and obtained as the result of successful litigation brought by TRAC's co-directors under the Freedom of Information Act. Since this is only the first month after Attorney General Sessions' announcement, prosecution numbers could well continue to build as the policy is more fully implemented. Sessions' recent announcement was not the first time the federal government has implemented a "zero- tolerance" policy. President George Bush initiated Operation Streamline in December 2005. It announced "zero tolerance" for illegal entry across specific segments of the U.S.-Mexico border. Operation Streamline called for federal criminal charges to be brought for every person who crossed the border illegally in these sectors. This continued to be the official policy under President Obama. Operation Streamline, plus the expanding number of border patrol agents, resulted in a deluge of criminal prosecutions for illegal entry and illegal re-entry that flooded federal courts situated along the southwest border with Mexico. See June 2008 TRAC report documenting the early impact of Operation Streamline. Prosecutions of CBP referrals over the decade since these earlier initiatives are shown in Figure 2. Given past "zero-tolerance" policies, criminal prosecutions under President Trump are still significantly below peak levels of criminal prosecutions during the administrations of President Bush and President Obama. However, as mentioned earlier, this is only the first month after Attorney General Sessions' announcement and it may take time to fully implement his policies. Where Along the Southwest Border Are Prosecutions Concentrated? Criminal prosecutions of referrals from Customs and Border Protection increased in April in all five federal judicial districts along the southwest border, although by varying amounts. See Figure 3 and Table 1. Prosecutions were highest in the Western District of Texas. In April 2018 Texas West prosecuted 2,767 individuals referred by the CBP. This is more than twice the level of prosecutions (1,357) than had occurred in January. The Southern District of Texas had the second highest number of prosecutions in April (1,959) but its increase was more modest (38%). Arizona had the third highest number of prosecutions in April (1,671), but its increase was just 18 percent over January levels. Arizona's growth rate of 18 percent was the smallest among the five border districts, while New Mexico with a jump of 110 percent experienced the highest increase. See Table 1. Federal prosecutors also reported prosecutions within districts by the specific border community where they were stationed. Trends in each of these specific border areas within the five districts along the southwest border are shown in Table 2. In April, among these border areas, prosecutions from CBP referrals were the highest in Tucson, Arizona. A total of 1,392 individuals were prosecuted in April there. This was only modestly higher than the 1,065 prosecuted in January 2018, and much below its previous monthly high of 2,541 prosecutions back in April of 2012. Las Cruces, New Mexico had the second highest number of prosecutions, doubling from 537 in January to 1,095 in April. According to federal prosecutor records, in April prosecutions reached an all-time high for that area. In third place was Del Rio, Texas, with 1,024 prosecutions of CBP referrals in April, up from 584 in January. Although prosecutions almost doubled, levels were still far below prosecution numbers from previous periods. El Paso, Texas; McAllen, Texas; Pecos/Alpine, Texas; and Laredo, Texas also prosecuted large numbers of CBP referrals during April, each numbered between 750 and 900. The Pecos/Alpine area in West Texas actually experienced the sharpest jump of any border area, up from a mere 55 prosecutions in January to 805 in April. In contrast, April numbers in McAllen, Texas, were actually down 22 percent from those in March. Federal prosecutors based in the San Diego area also prosecuted an apparent record all-time high of 589 individuals during the last decade for that location. * Within federal districts, border communities are where federal prosecutor was based. Three border areas reported each prosecuting over 100,000 individuals who had been referred by CBP over the last decade. These three were Tucson, Arizona; Laredo, Texas; and Del Rio, Texas. While each of these also recorded increasing prosecutions in April 2018, the latest month's numbers were well below levels recorded in the past. Thus, the recent large jump in border prosecutions should be kept in perspective. 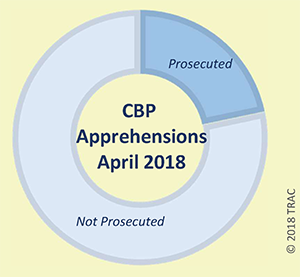 April numbers even for border areas that historically have experienced particularly high CBP referred prosecution levels are still significantly lower than peak periods from the past. See Figure 4. Southwest Border Patrol arrests totaled 38,234 in April, only slightly more than the 37,383 individuals apprehended in March. This is up from the 25,978 apprehensions during January. Apprehension numbers include children, whether traveling by themselves or in family groups - perhaps roughly a quarter of recent Border Patrol apprehensions. The "zero-tolerance" policy may not be interpreted to apply to them. If children are excluded, then prosecutions represented perhaps 29 percent of BP arrests. Adding to the difficulty of estimating how many the zero-tolerance policy applies to, many individuals are also taken into custody at ports of entry. A number of these sought to enter illegally through forged papers, or by some other pretext. Once ports of entry apprehensions are added, total CBP southwest border apprehensions totaled 50,924 in April, 50,296 in March, 36,682 in February, and 35,817 in January. However, undoubtedly many of these arrested at ports of entry were seeking asylum and thus may not have been subject to criminal prosecution. To be conservative, all arrests at ports of entry were excluded in calculating the proportion prosecuted. Had all CBP arrests been counted, criminal prosecutions in April 2018 would have represented 16 percent rather than 22 percent. Figures also included illegal entry and illegal re-entry referrals that federal prosecutors recorded as coming from U.S. Citizenship and Immigration Services since actual apprehensions appear to have been by CBP.